I admit, I have been entertaining thoughts of deleting this blog and never ever thinking about what I posted here. But . . . I wanted to rant and I can’t anywhere else otherwise my friends are going to shoot me. This is going to be long, people. Sit down and try to keep up. Note: The title is self-explanatory. There was a thing about my friend N, which A, her friend told H, his friend. H mentioned it to his girlfriend, M.
Z and S (hesitantly) told N.
Z and S cornered NA. H discussed it with is girlfriend (same one), M.
M may or may not have insulted S.
S wasn’t sure. She was offended nonetheless. Now, Z and S may just threaten NA. They may just consult A. A may just rant in front of H.
H may just ask M’s opinion. Here? Wait . . . don’t leave yet! You may have guessed what I will do. And probably make plans to tie them to chairs, lock them in a room, and threaten them unless they talk. Just for the sake of the one’s who skipped this after two lines, here’s a quick diagram I made. Nah, just kidding. Too much work. But . 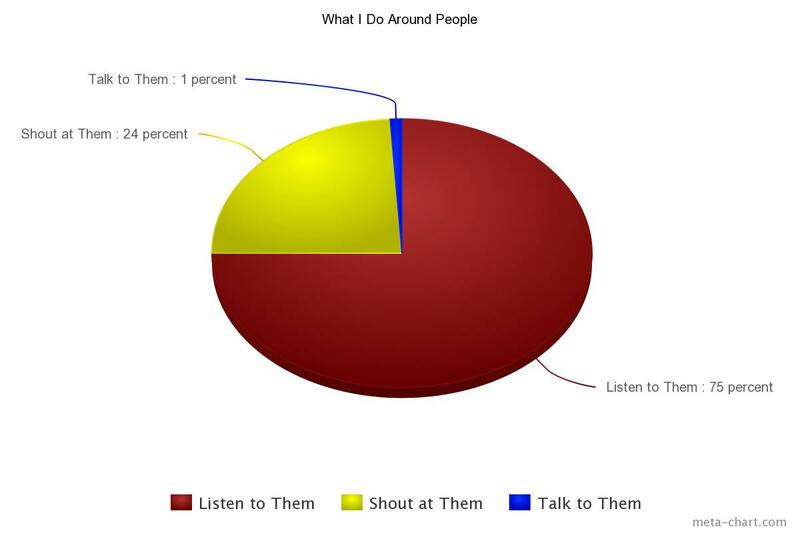 . . pi charts are easy, so here you go.